A novel computational procedure called the scaled boundary finite-element method is described which combines the advantages of the finite-element and boundary-element methods : Of the finite-element method that no fundamental solution is required and thus expanding the scope of application, for instance to anisotropic material without an increase in complexity and that singular integrals are avoided and that symmetry of the results is automatically satisfied. Of the boundary-element method that the spatial dimension is reduced by one as only the boundary is discretized with surface finite elements, reducing the data preparation and computational efforts, that the boundary conditions at infinity are satisfied exactly and that no approximation other than that of the surface finite elements on the boundary is introduced. In addition, the scaled boundary finite-element method presents appealing features of its own : an analytical solution inside the domain is achieved, permitting for instance accurate stress intensity factors to be determined directly and no spatial discretization of certain free and fixed boundaries and interfaces between different materials is required. In addition, the scaled boundary finite-element method combines the advantages of the analytical and numerical approaches. In the directions parallel to the boundary, where the behaviour is, in general, smooth, the weighted-residual approximation of finite elements applies, leading to convergence in the finite-element sense. In the third (radial) direction, the procedure is analytical, permitting e.g. stress-intensity factors to be determined directly based on their definition or the boundary conditions at infinity to be satisfied exactly. In a nutshell, the scaled boundary finite-element method is a semi-analytical fundamental-solution-less boundary-element method based on finite elements. The best of both worlds is achieved in two ways: with respect to the analytical and numerical methods and with respect to the finite-element and boundary-element methods within the numerical procedures. The book serves two goals: Part I is an elementary text, without any prerequisites, a primer, but which using a simple model problem still covers all aspects of the method and Part II presents a detailed derivation of the general case of statics, elastodynamics and diffusion. 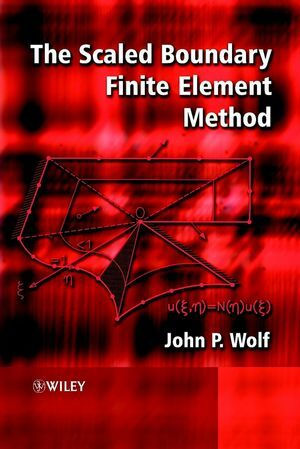 John P. Wolf is the author of The Scaled Boundary Finite Element Method, published by Wiley. PART I. MODEL PROBLEM: LINE ELEMENT FOR SCALAR WAVE EQUATION. CONCEPTS OF SCALED BOUNDARY TRANSFORMATION OF GEOMETRY AND SIMILARITY. WEDGE AND TRUNCATED SEMI-INFINITE WEDGE OF SHEAR PLATE. MODELISATION WITH SINGLE LINE FINITE ELEMENT. HIGH-FREQUENCY ASYMPTOTIC EXPANSION FOR DYNAMIC STIFFNESS OF TRUNCATED SEMI-INFINITE WEDGE. NUMERICAL SOLUTION OF DYNAMIC STIFFNESS, UNIT-IMPULSE RESPONSE AND DISPLACEMENT OF TRUNCATED SEMI-INFINITE WEDGE. ANALYTICAL SOLUTION IN FREQUENCY DOMAIN. APPENDIX B: HARMONIC MOTION AND FOURIER TRANSFORMATION. APPENDIX C: DYNAMIC UNBOUNDED MEDIUM-STRUCTURE INTERACTION. APPENDIX D: HISTORICAL NOTE. PART II. TWO- AND THREE- DIMENSIONAL ELASTODYNAMICS, STATICS AND DIFFUSION. MASS MATRIX OF BOUNDED MEDIUM. HIGH-FREQUENCY ASYMPTOTIC EXPANSION FOR DYNAMIC STIFFNESS OF UNBOUNDED MEDIUM. NUMERICAL SOLUTION OF DYNAMIC STIFFNESS, UNIT-IMPULSE RESPONSE AND DISPLACEMENT OF UNBOUNDED MEDIUM.